We always hear about position in poker and Hold’em. Most of the time, acting last is the advantageous position. This makes playing more hands, more aggressively, from late position profitable. After all, when the players before you show weakness, you can represent strength and take down a pot that your cards might not warrant. Further, if one or more players acting before you show strength, you can confidently lay down weak hands, knowing you’re probably not missing much. Less often, acting first is best. This happens primarily in tournaments, when the stacks are low relative to the blinds. In those cases, a raise and a call preflop makes the pot big enough that the first bet after the flop is a realistic all in. In contrast, in a cash game, with normal size stacks, it can take a pot size bet on each street to get all in (unless someone makes a ridiculous overbet at some point or there are multiple raises). Acting first and shutting out your opponent is best only when the bet is all in or close to it, making position irrelevant. If the pot is 3000, and you only have 2000 left, your all in bet on the flop puts your opponent to the test, even if she is in a later position. She can’t raise to get you to fold; you’re already committed. It is true that she might save a bet by seeing your action before acting herself (if you have a strong hand and would call her bet), but you have the advantage when it comes to the aggressive action. There is a way to partially offset the positional advantage if you find yourself first to act with a decent, but not strong, hand. That is to use a check-raise on the flop or a later street. Say you find yourself in the big blind with A7 suited. A hyper aggressive player in late position raises to four times the big blind preflop, and you elect to call. Against a tighter poker player, A7 is a poor calling hand. Aces with bigger kickers are such a big part of their range that you are likely to be dominated, and could be in big trouble if an ace flops. You’d be better of calling with T8 or a low pair. Against the loose, aggressive playing style, a call with A7 is fine occasionally. You can’t really reraise preflop there, since their range is so unpredictable and you’ll be in a rough spot when you (probably) miss the flop. 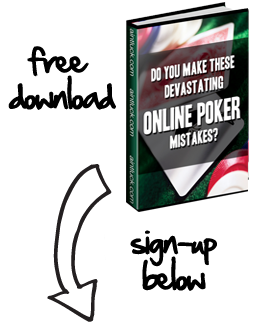 Ideally, you are looking to catch part of the flop, creating a situation where you can extract some value. Even checking, then calling the flop, might curb their aggression somewhat, but what we’re really looking for is a way to keep them from attacking your blinds quite so much. You’re walking a fine line with this situation. You have to defend your blind significantly against the aggressive opponent, but you can’t just wait for big hands to reraise with. They’ll run over you in the meantime. The very best solution is to find another table with more passive opponents (which is always best), but that’s not always feasible. You occasionally have to take shots with reasonable hands and extract a fair amount of value when you do catch to make up for the times that you call and miss. Part two of this article (Using the Check Raise When Out of Position), looks at a realistic postflop situation that can occur in this scenario and how to play it.